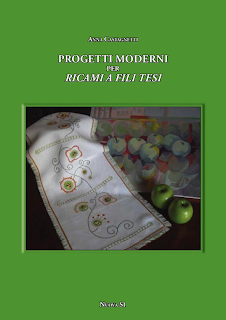 Ebe Ciampalini Balestri has just released her latest book, this time it is a style of embroidery which she invented herself, inspired by the ruins of an ancient castle near where she lives in Tuscany. If you have Facebook, you can visit the archaeological dig's page and read in English and Italian what they've been doing and look as some photos in their photo albums. 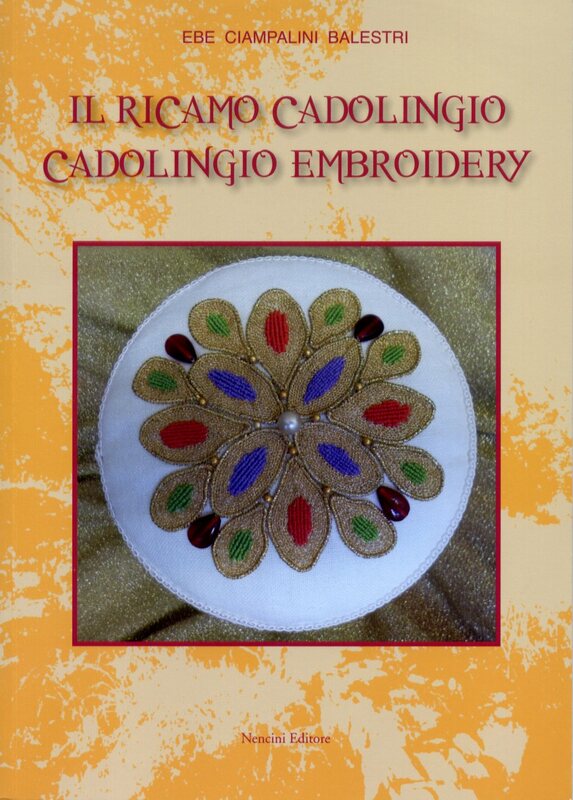 Cadolingio Embroidery, or Ricamo Cadolingio as it is called in Italian, falls under the category of metal thread work and reminds me of the ancient works like Queen Constance's crown found today in Palermo's Cathedral. The book is 51 pages long and is divided into two sections: Italian first and English second. 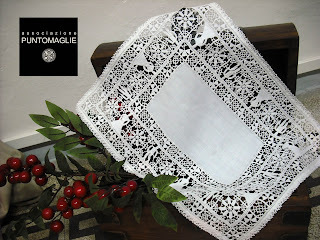 Each section is further divided into subsections which list the materials used, technical information including finishing ideas, the history of the family and the castello which inspired this embroidery, seven different projects and more ideas and then the bibliographical notes. Ebe, acknowledging the economic difficulties of our times, has sourced materials which are easier to fit into your budget than real gold threads and gems for the projects of this manual but if you have the resources for using more expensive materials, that option is always open to you. The projects are delightful and not your usual embroidery items, here there are mirror and picture frame surrounds, small boxes of various shapes and eyeglasses cases. As the materials used are synthetic, they are also washable, making the projects more usable. Speaking of eyeglasses cases, Ebe made one for me! As usual when I translate things, I learned a lot. This book taught me not only about the different aspects of this embroidery style but also about a family's history which I always find fascinating. 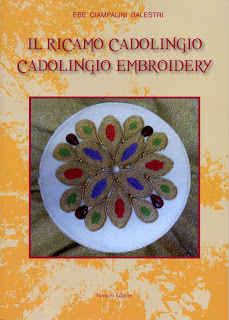 You can purchase Cadolingio Embroidery from Tombolo Disegni, send an email request to order. I know almost nothing about Genoa, Italy in relation to textiles. 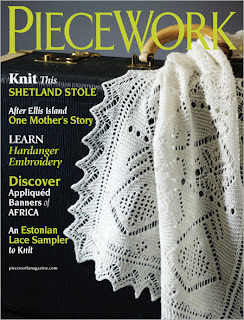 I've never been there and so it is conspicuously missing from the range of needlework that I've talked about here. 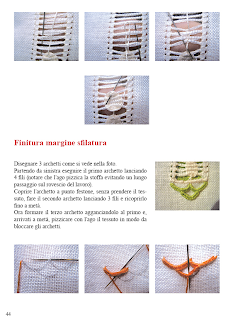 I was recently contacted by Maria Daniela Lunghi, a fibre artist, author and textile history specialist from Camogli in the province of Genoa. 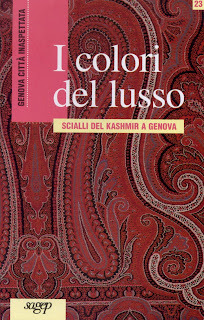 She was kind enough to send me some textile museum catalogues from Genoa. Now, you might be thinking: What do cashmere shawls have to do with Italy? Well, you may or may not know that Europeans had some periods of time where Eastern designs, fabrics and customs became very fashionable. Periods of Turkish, Chinese, Japanese, Bedouin as well as other eastern styles each had their turn influencing the latest fashions for European women and men and India had her turn as well. 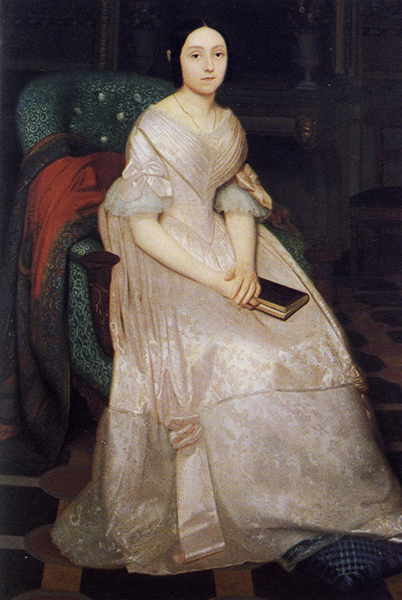 Marchesa Emilia Negrone Centurioni by Giuseppe Antonio Frascheri. Oil on canvas. Villa Saluzzo Serra di Nervi, Galleria d'Arte Moderna, Genoa. 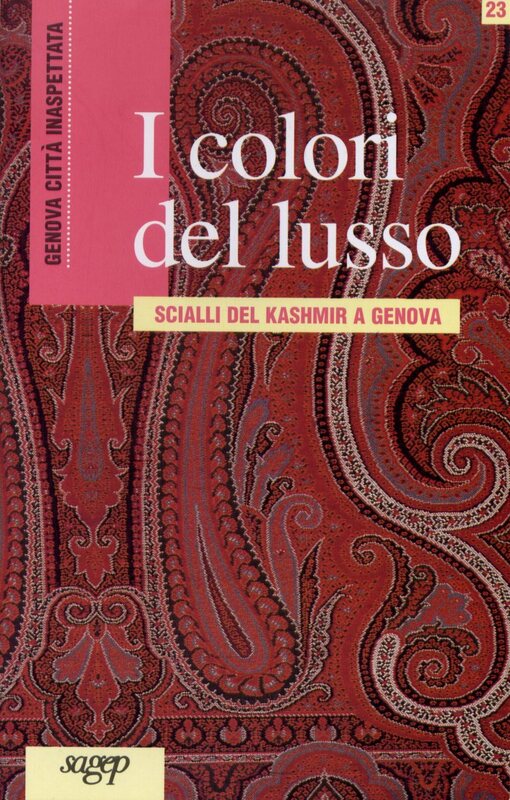 This little catalogue also discusses the influence of these shawls on the fashion pages of French magazines, the commerce of Kashmir shawls in Genoa and the relationship between Genoese men and women and Kashmir shawls. There is a small bit at the end about the restoration and conservation of this collection. I learned quite a bit about these shawls and their high appreciation by Italian women of the period between 1770 and 1870. Thank you M. Daniela Lunghi for this fascinating lesson in fashion! 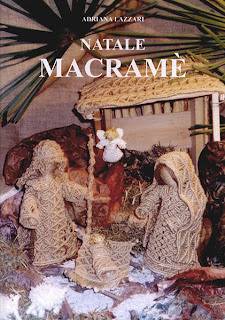 I finally treated myself to Adriana Lazzari's Christmas Macrame book, I've been looking at it since it come out in 2009. Some years ago I tried to create a Santa Claus out of Macrame from a RAKAM magazine but he never really worked out and last year I wanted to create this bell, but even with help and infinite patience from the ladies over at Tuttoricamo, I didn't get very far. This year, I've had some practise and am determined to create some kind of Christmas ornament in Macrame. This nice little book has 55 pages, the text is only in Italian but there are lots of diagrams and photos, if you know your way around Macrame, you'd probably have no trouble if you don't speak Italian. 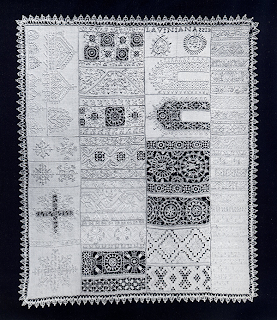 The first section deals with materials and the basic knots after which follows the patterns and ideas section which is the larger part of the contents. The projects include three angels, a chimney-sweep, a couple of brooms, two Christmas trees, a snowman, a witch, a poinsettia, the Nativity Scene from the front cover, three snowflakes and a bell. A bell very similar to the one I was trying to make last year. (If you're wondering, the broom, chimney-sweep and witch relate to the Italian tradition of the Befana coinciding with the Epifany on the 6th of January). I like Adriana's books as she always tells you how much thread to cut. This helps math-challenged people like me as it leaves nothing to chance. I think I'll make one of the snowflakes to start out, they look like something I might be able to handle. I'll let you know if I succeed. If you're outside of Italy, you can purchase this book from TomboloDisegni, click on "Libri", then "Libri Macrame": send an email to order, she takes PayPal. 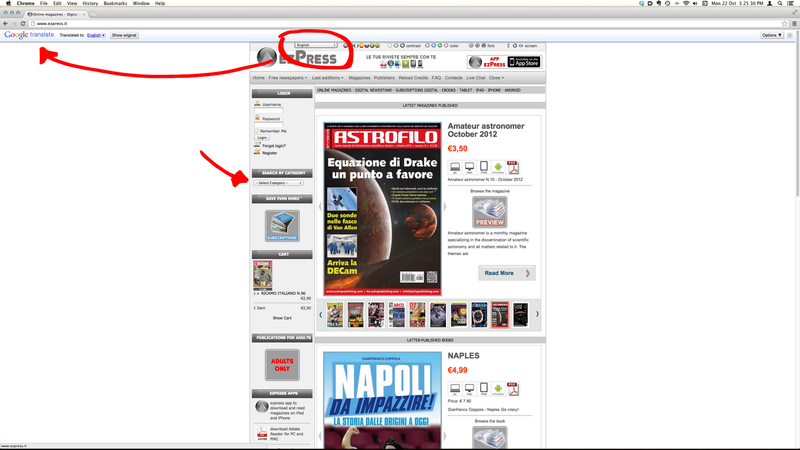 If you're in Italy, you can contact the author at her website. You have seen several posts here regarding the Needleprint blog's A Mirror to my Art Contest. 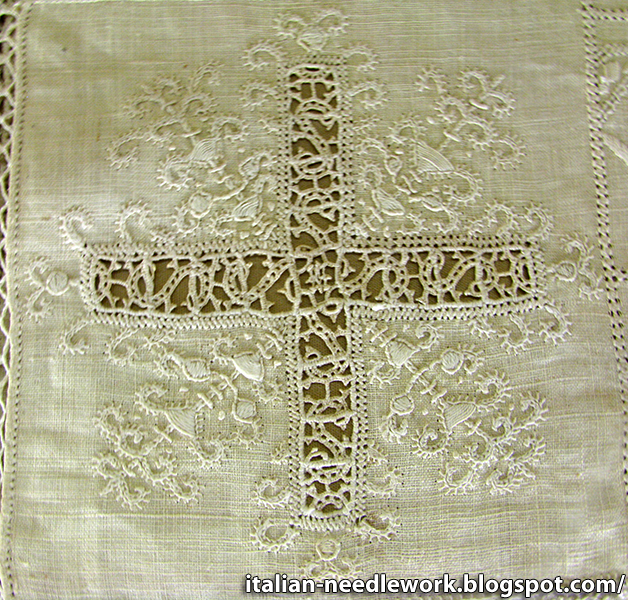 I was personally very taken with the concept and enthusiastic to invite some of Italy's needleworkers to join. 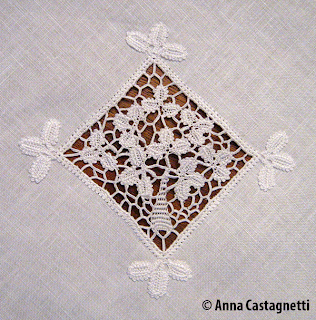 I'm proud to say that several Italian stitchers stepped up and 4 of them became finalists with the 3rd place prize being shared between two works, one of which was the stunning gold and silk embroidery by Francesca from Rome. Check out Francesca's blog where she describes (in English!) the creative process of her design. Don't miss this post about Francesca's mirror art at the Needleprint blog either. 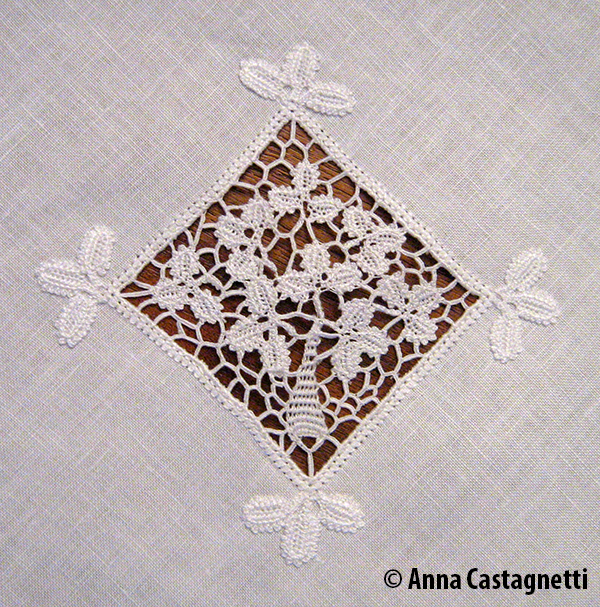 Silvia from Turin was a finalist with her needle lace/trapunto combination inspired by an amazing tablecloth in Aemilia Ars work held by the Palazzo Davanzati Museum in Florence. She has written about her creative process in this post on her blog as well as being the subject of a spotlight post here on the Needleprint blog. Elisabetta from Ferrara was named a finalist with her beautiful Estense Embroidery mirror. Attention to detail going right down to the beads on the cording closure which match the thread colours of the embroidery! Rosella from Milan was a finalist with 2 designs (see them here and here) of the 5 embroideries that she submitted! Rosella has kindly allowed me to show you her other works which were submitted to the contest. Rosella told me that she was inspired for one of her entries by an old collection of patterns given to her by a 91-year-old friend. These old patterns had belonged to the friend's mother, some of them dating back to the late 1800s. Rosella's friend was pleased that the patterns had inspired one of Rosella's entries for the contest and she was sure that her mother would have been pleased as well. Thank you Rosella for sharing your photos! 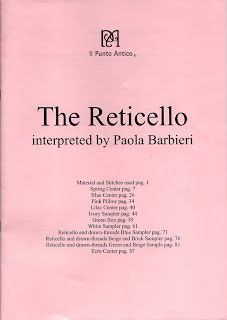 A quick note to let you know that the English translation booklet (pictured above) is now available for the book Il Reticello interpretata da Paola Barbieri published by l'Associazione Il Punto Antico. If you've hesitated to get this lovely book because it was only in Italian text, now you don't need to hold off anymore. While the website says that the English will be available soon, I know that it is available now as I have waited to get the printed copy in my hands before announcing it's availability to you. 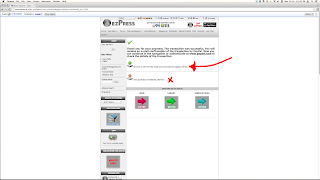 In the pages that follow, you will find very simple and accurate instructions. In fact, several times I choose to also repeat the various steps required for creating a quadrant, in order to be very clear, so as to allow those who have never experimented with reticello to be able to approach this technique. If you purchased this book already and want the English text, contact the Associazione Il Punto Antico to get your insert sent to you. I seem to have less and less time for my blog as I do more and more translations but I cannot give it up just yet. Quickly I want to tell you a fun story. 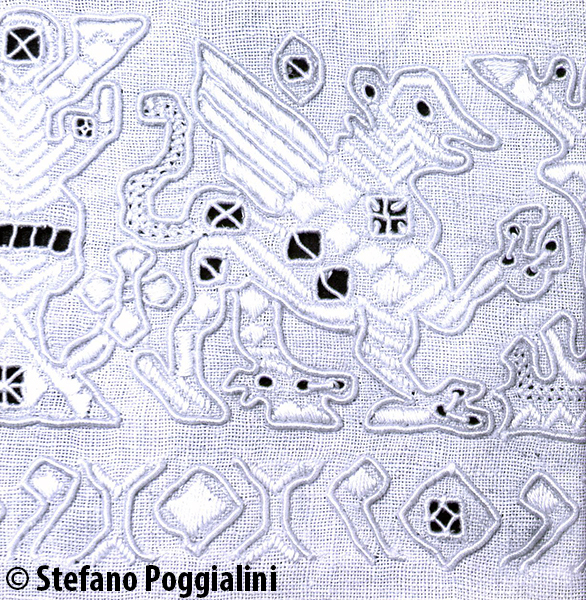 Some years ago I corresponded with Maria Elide Melani of the Associazione Ago Aga e Fantasia while she was researching Deruta Sfilato or Deruta Drawn Thread Work Embroidery. We have since met (at Italia Invita 2011) and correspond once in awhile. She wrote a lovely book on the technique, which I told you about here. I have been very lucky with my internet friendships and I have been able to meet lots of great people who share my interests. 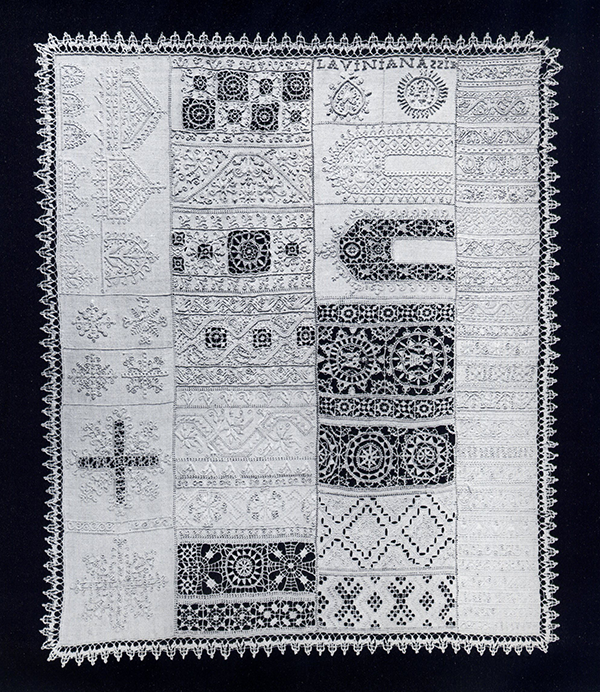 I have been very enthusiastic in my reporting of Maria Elide and her endeavours because I find her to be a delightful person as well as a talented embroiderer. 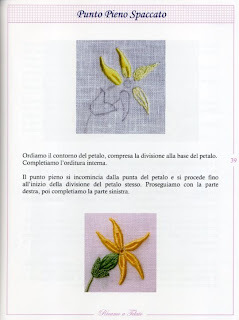 Some time ago, a reader of my blog from the Netherlands wrote to me that she was going to Tuscany and wanted to learn about Deruta Drawn Thread Work. I put her in touch with Maria Elide and they enjoyed a lovely visit together. 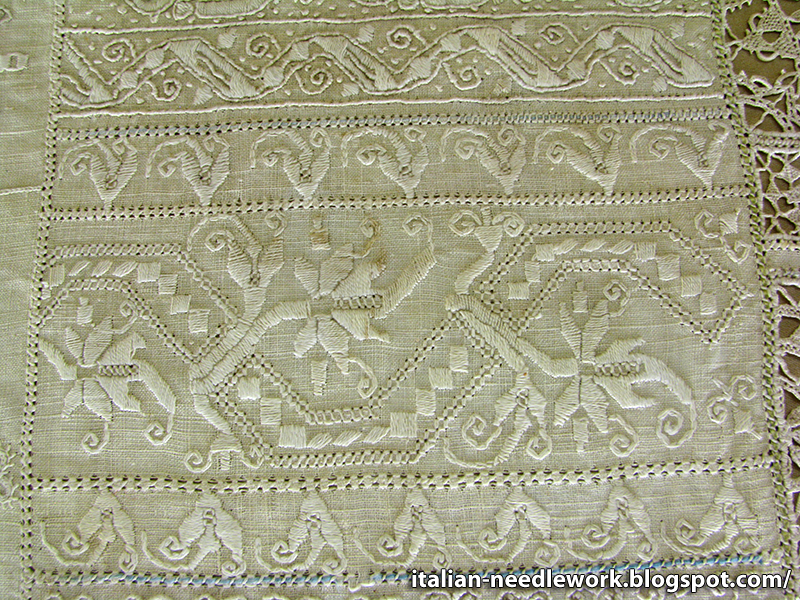 Then a couple of readers from other countries did the same and I was excited to assist in the discovery by stitchers outside of Italy of this wonderful Italian needlework. But the best has got to be when you assist without knowing it. 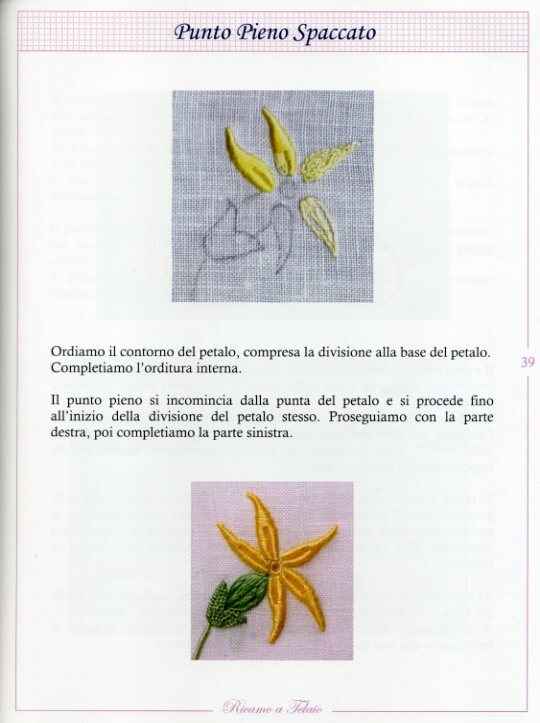 Maria Elide was contacted directly by a whole group of Japanese stitchers who were going to Italy and wanted to learn Deruta Drawn Thread Work while they were there. Maria Elide didn't understand how they had found her or why they would choose her over the many embroidery schools in Italy but when the group arrived they showed her a printout of my blog post about her! When she wrote and told me after they were gone, she assumed that I had known - but I was completely ignorant! I'm very happy to have helped these people and hope that my readers find things of interest in the posts that I write, however infrequently they seem to be written these days. Napkin with corner insert of Punto Maglie needle lace. Image copyright Assn. Punto Maglie. 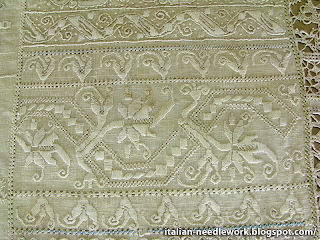 Central insert of Punto Maglie needle lace for the tablecloth. Image copyright Assn. Punto Maglie. Following the theme of the exhibition: Green Monuments of Umbria - the trees, we can identify the leaves and the fruit of the Olive tree in the Punto Maglie pieces pictured above. Besides occupying an important role in mythology and symbology, the olive is also predominantly present in the two regions of Umbria (where the exhibition was held) and Apuglia (where Punto Maglie comes from) thus, this entry creates a bond between the two areas. Exhibition participants were required to demonstrate the development of their ideas for their patterns on paper and produce pieces of their chosen lace or embroidery for a six setting tablecloth (140 cm x 160 cm) with matching napkins (40 cm x 40 cm). 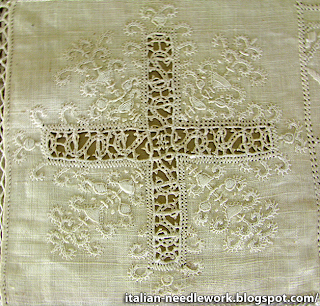 The central insert of Punto Maglie needle lace pictured above measures 30 cm x 21 cm. 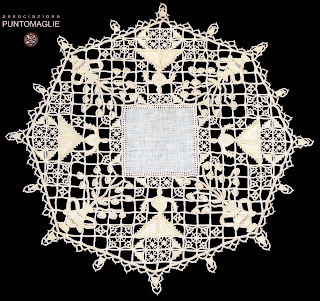 I wrote to Liliana Ciriolo of the Associazione Punto Maglie to ask her some details about this prizewinning lace which she made together with Anna Borgia, Mina Saponaro and Renata Skovran from a design by Alessandra M. Chiurazzi inspired by a 16th century model. 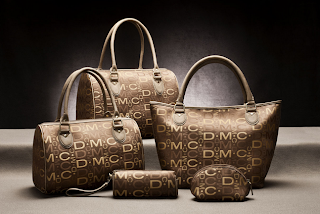 It took them a month to make the pieces using white DMC no. 80 thread. 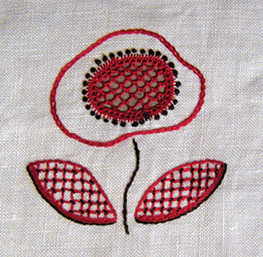 Stitches employed were the buttonhole stitch, the cording stitch, picots and the net. Congratulations to the women of the Associazione Punto Maglie and thank you for sharing these pieces with us! On November 4th, the town of Maglie was featured on an Italian TV program "Ti ci porto io" [I'll take you there]. 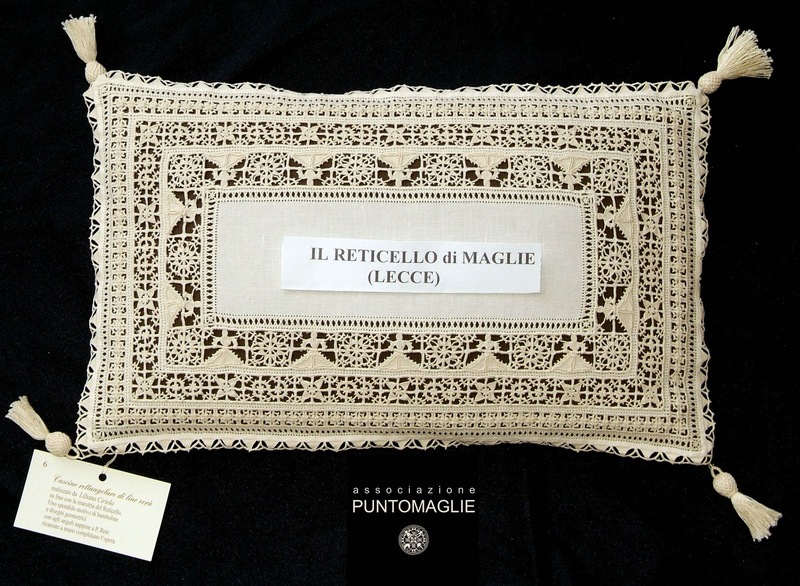 Around the 8:25 mark of the video below, you can see how they execute Punto Maglie needle lace and see some of the Associazione Punto Maglie's work which includes a bridal gown which took four women more than 5 months to make. The interviewer says: Four people took five months to make it? Why do you do it? Anna Borgia answers: For love. The interviewer then asks how much it might cost and she asks for a ballpark figure. Anna Borgia: Around six thousand euros. 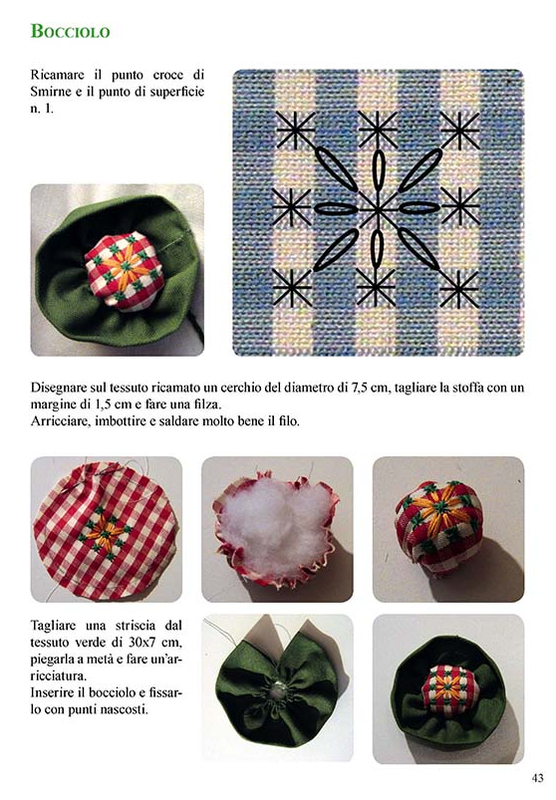 For those who would like to learn to use an embroidery hoop to aid in creating beautiful traditional needlework, Anna Rondelli of Bologna has just released her second publication: Ricamo a Telaio [Embroidery using a hoop]. Through the pages of this book, we learn how to hold the hoop in hand. It is the "ABCs" of embroidery that you should know before moving on to more complex techniques. 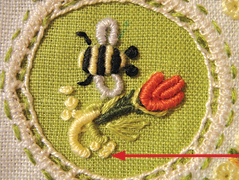 The principal stitches of embroidery executed using a hoop like cording stitch, padded satin stitch, shadow work, buttonhole stitch edgings, Rodi Stitch and many others and their variations are explained step-by-step. Different projects are presented in detail in the third part. The designs of some of the work (on transfer paper and ready to use) are enclosed in a separate envelope. 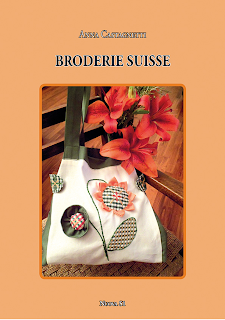 This publication may be useful to experts for consolidating their technical knowledge and for beginners who want to get to know embroidery using a hoop. 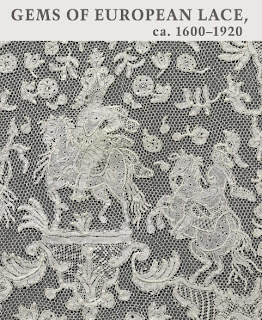 This book is also a showcase of Anna's gorgeous traditional embroidery. 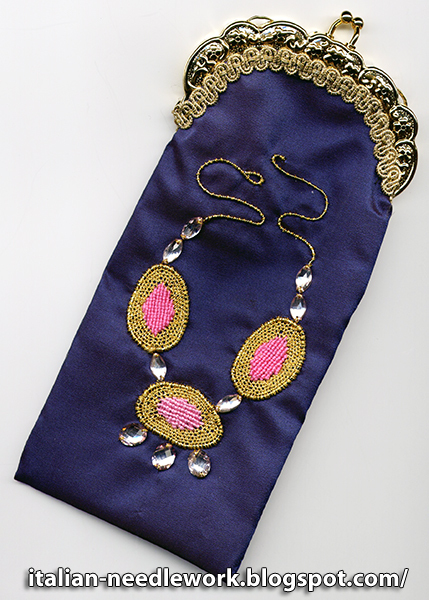 There are some designs dedicated to the bridal trousseaux in elegant colour choices. 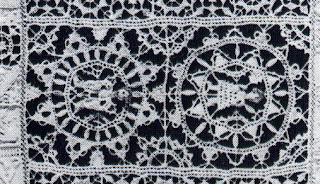 Anna dreams of continuing to publish more and more complex stitches and techniques in the future, so if you enjoy this book, there may be more to come. The text of this book is in Italian. If you're in Bologna from the 16th to the 18th of November 2012, you can get your hands on this book by attending the fair Il Mondo Creativo in Bologna, otherwise you can contact Anna through her website La Prilletta. For a review of this book in Italian, see the TuttoRicamo blog. Inside you will find the story of the Scuola d'Industrie Italiane of New York by Ivana Palomba. Some of you may remember me telling you about Ivana's thesis being published last year on Carolina Amari and her impact on the emancipation of women. This article tells of the school/workshop that Carolina Amari and Florence Colgate started in 1905 in New York for italian immigrant girls as a means to earn a living without having to work in a sweatshop or factory. While translating this article I have to say that I was fascinated by the lives of the women we tried to research and found it immensely frustrating to be so far from New York and all the archives that are there. If you have an ancestor who was a student of the Scuola d'Industrie Italiane of New York. I would love to hear from you! 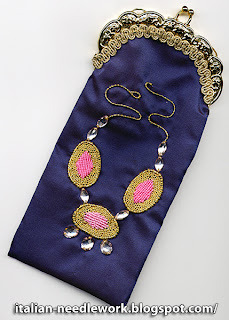 Photo by Joe Coca, image copyrighted by Interweave. 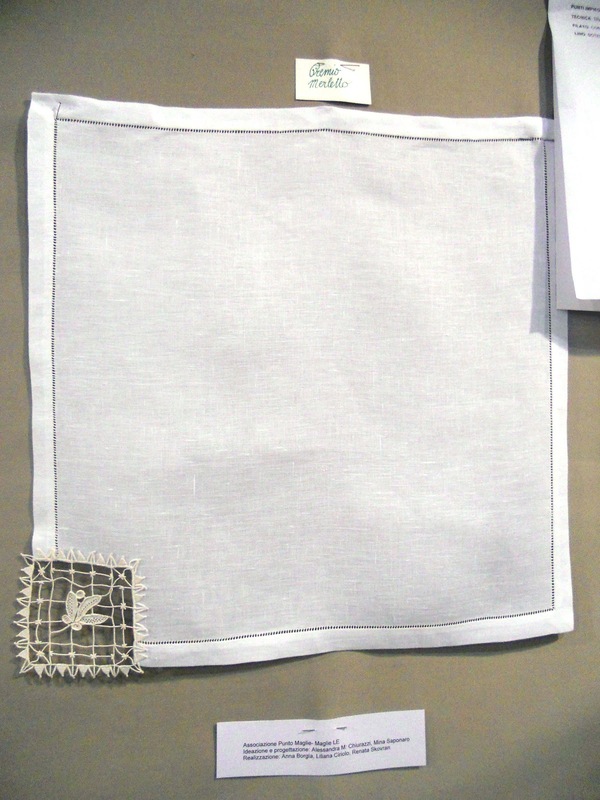 As Piecework required a project to accompany the article, there is a Punto Antico needlebook inspired by a card case featured in an advertisement for the Scuola D'Industrie Italiane from The Journal, November 1908. I hope to have more news early in the new year regarding the Scuola D'Industrie Italiane of New York, so keep an eye out for further developments! The 6th International Italia Invita Forum of Textile Creativity has updated their website to include the theme and competitions for the next Italia Invita Forum in Parma, Italy on May 10 - 12th, 2013. 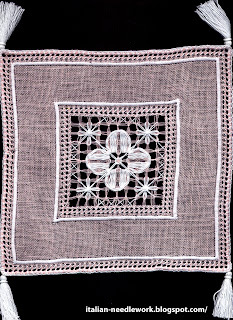 Techniques covered at the next Forum will include: Embroidery, Lace, Quilting, Knitting, Crocheting, Felting, Cross Stitch, Weaving, Straw Plaiting, and just about any other textile art. ...the theme is “Intreccio Internazionale” because we will search the path that “the thread” has made, prior to materialize into an art, a technique, a precious artifact. An invitation to retrace the steps through which every single work of each school has reached perfection, thanks to contamination with other techniques. The topics chosen for 2013 are ‘circle’ and ‘internationality’: one as a symbol of unity, of what has no beginning and no end, and the other as the basis of the “growth” due to the exchange between different cultures. 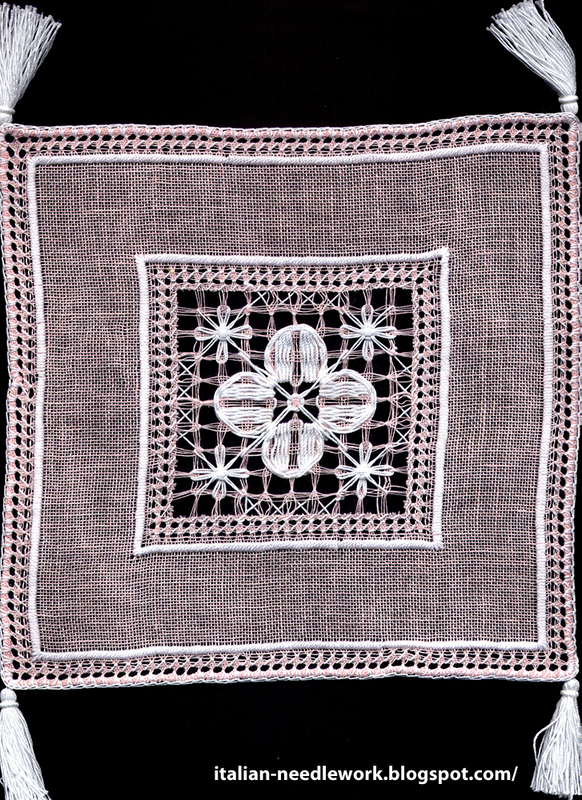 The Squaring the Circle competition is open to individual quilters, groups and associations and the International Circle competition is open to anyone who wants to use any textile method to create a themed piece. Prizes include a Juki sewing machine, a Juki cutting and sewing machine, Aurifil threads and €1,800.00 in vouchers to spend at the Italia Invita Forum in the vendors section. The rules are only in Italian because the competition is reserved only for Italian citizens due to issues with the Government. Unfortunately, the law does not allow Italy to organize international competitions and so we were forced to deal with this limitation. There will be workshops and classes that you can register for and attend and I am told that a list of these will be available in the next couple of weeks. A list of exhibitors and vendors will become available after the new year. 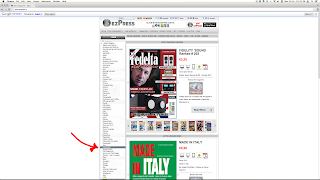 So check back to the Italia Invita website often for updates. Truly, if you get the chance to go, make the effort. No where else can you get so many Italian needlework schools, teachers, techniques and supplies at a single event. 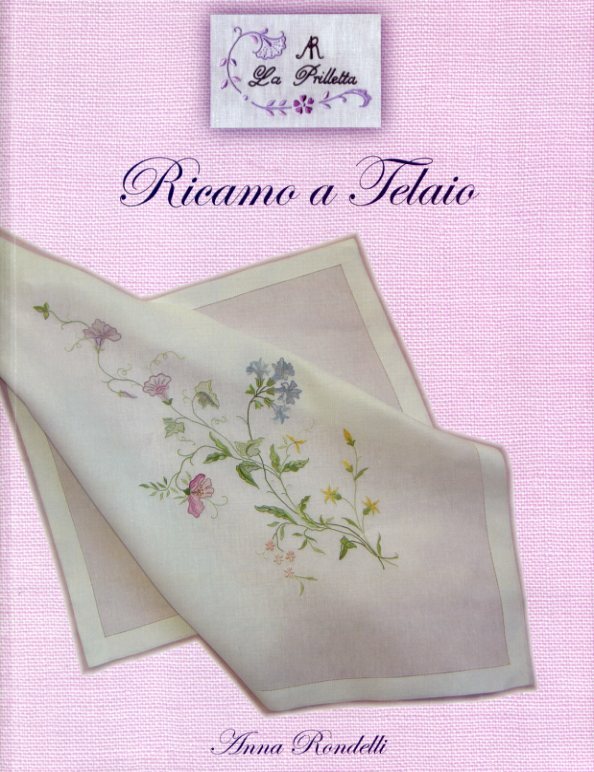 I used to subscribe to one of the Italian needlework magazines called Ricamo Italiano which started up in the fall of 2004. The subscription for overseas was about double the European price but at the time I could afford it and anyway, I usually figure on paying about double the cover price for any publication from Italy because the shipping is so much. 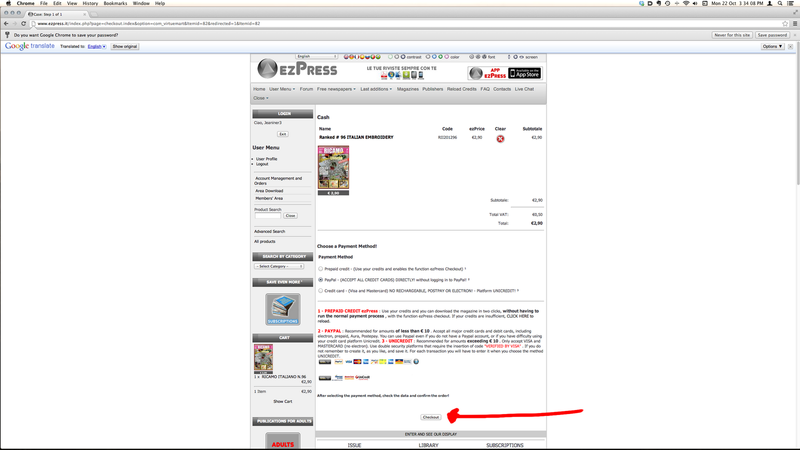 In 2010 they decided to raise the overseas price for a subscription so much that I had to give them up. 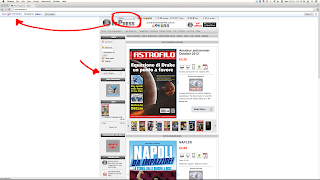 Silvia from Turin emailed me to say that she had discovered that they now have a digital edition which you can purchase and download instantly. I decided to purchase an issue and take you along with me for the ride. Before we get started, let me say that I'm not recommending/soliciting this magazine and I don't earn anything by this post. This is just an adventure in Italian Needlework. I took screenshots along the way and then added some arrows in with Photoshop. My monitor is a 27 inch iMac so I'm sorry, there is a lot of white space but I didn't want to cut anything off that might help you if you were going to try this. Now, I didn't find anything indicating that this was even available on the Ricamo Italiano website, but there might be something there that I just didn't see, or they may have updated it since this post if you're reading this sometime in the future. 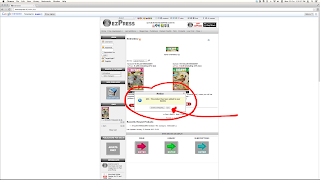 Arriving at the EZPRess website, which thanks to Silvia, we know exists, use the pull down menu at the top for English or which ever language you like, it uses Google Translate which does an okay job for what we need here. 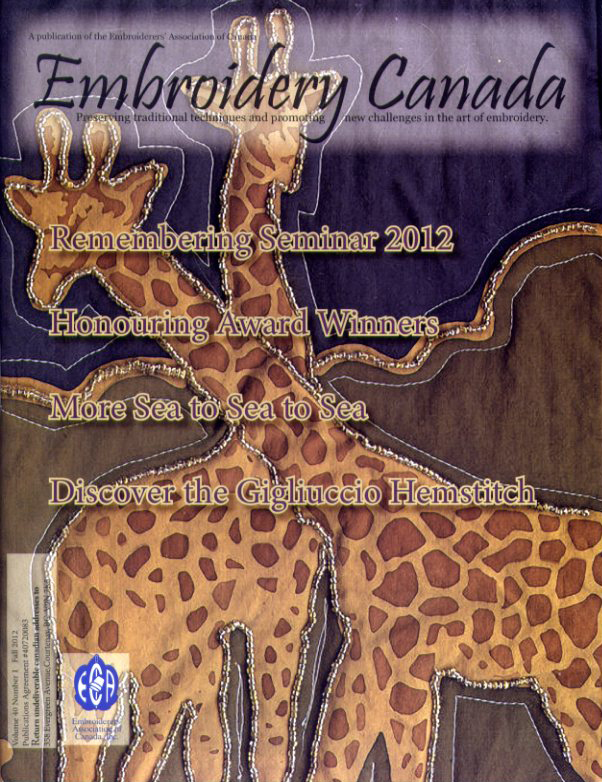 There are only two choices for "embroidery" and they are both Ricamo Italiano, so you can take your pick between September 2012 (issue 95) or October 2012 (issue 96) or you can sign up for a subscription. 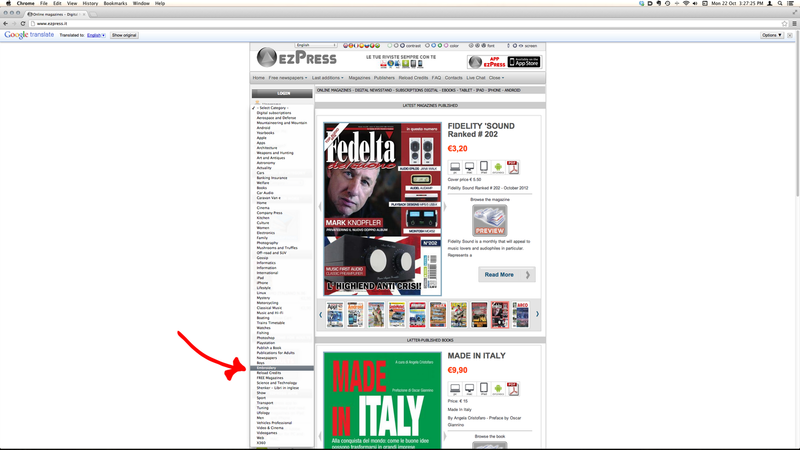 I chose issue 96 and clicked on "acquista ora" - the buttons don't translate. 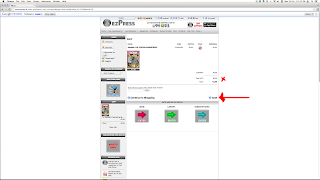 When you click the button a little pop up menu tells you that what you've selected has been added to your cart and you have the option to continue shopping or going on to the cart and paying which is the option I chose. 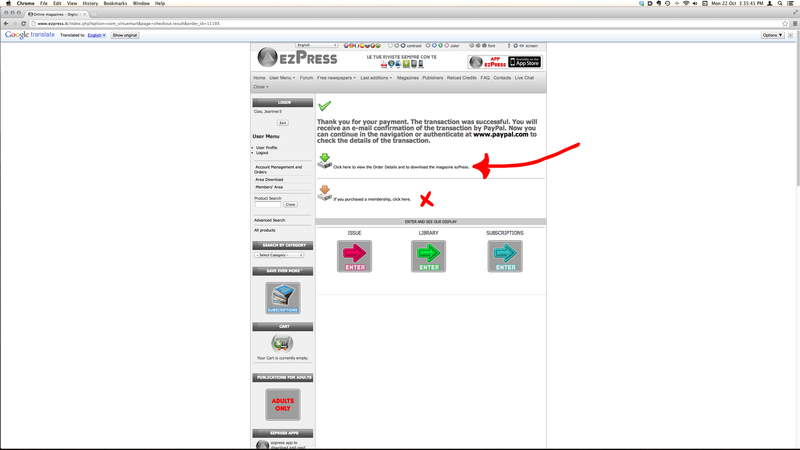 Now you must click on "cash", you'll notice my "x" shows that you must pay the value added tax or VAT. Many international websites are set up so that the program knows if you're overseas and that you are not required to pay the VAT. This is not one of them. I also understand that in Italy there is a difference in business license, if you anticipate mainly Italian clients, you choose one license, if you anticipate international clients, you choose the other (more expensive) license. These people are anticipating Italian clients and I'm not going to argue over €0,50 which is like, $0.65USD. 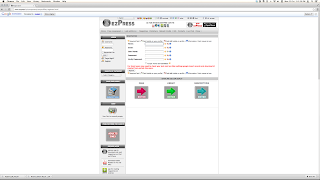 Now we must register with EZPress. 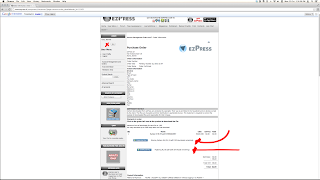 Click accordingly and you will land at the page which gives you some advice about google.mail clients. I forgot to take a screenshot of this page until after I'd finished, so you may notice in the next photo that my cart is empty on the left. Yours however should still have your magazine in it. 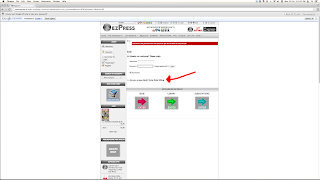 Click "register" and we go on to the cart where you have your choice of payment methods. 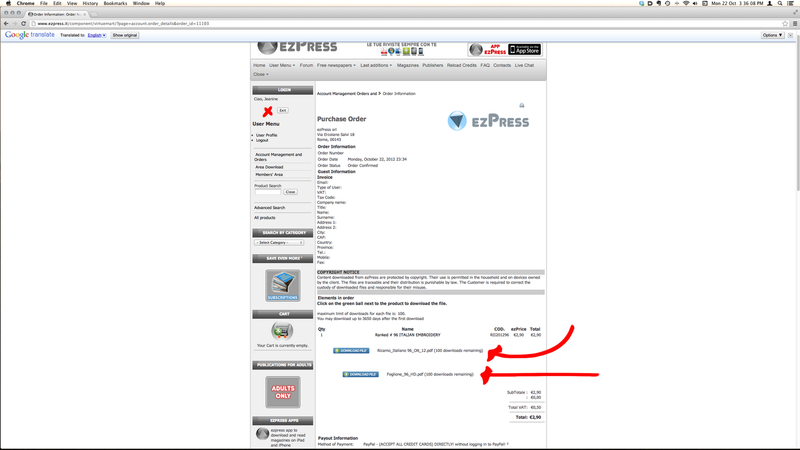 I chose PayPal and then "check out" at the bottom. 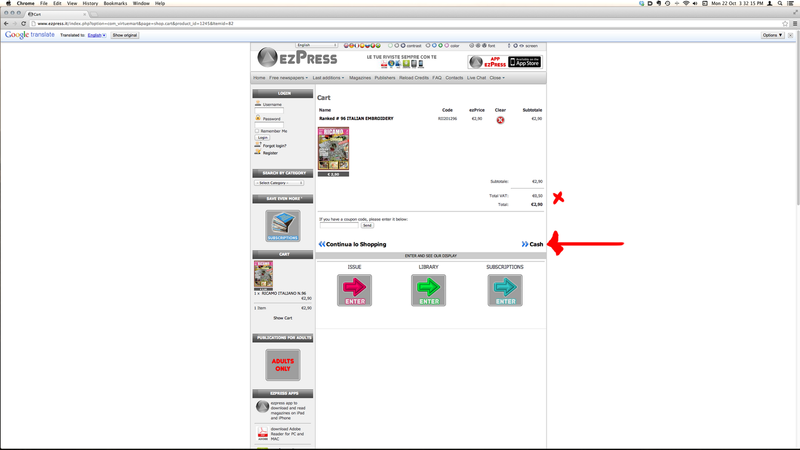 Now, I wasn't quick enough to get the next screenshot but a big green check mark flashed on the screen and some text telling me that I'd entered my order correctly and that I was now being re-routed to PayPal's website, which I was. 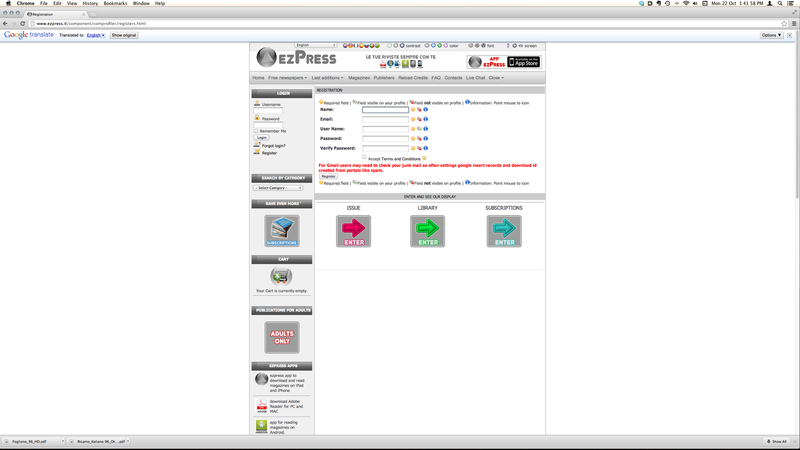 After completing my PayPal payment, I chose to return to the EZPress website and landed at this page. 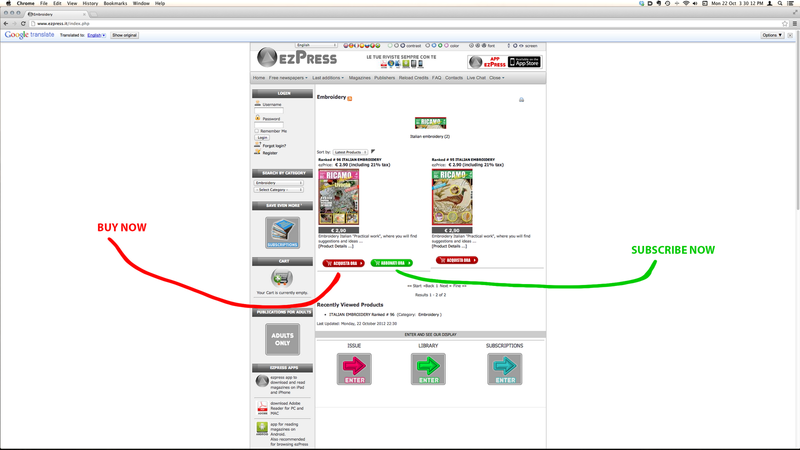 I clicked where I indicate with the red arrow, but if you chose a subscription you must click where I've put the 'x". 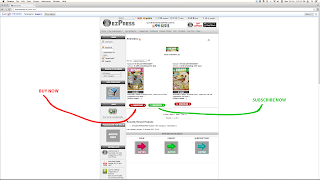 This brings you to your order summary and you must remember to download both the magazine and the "foglione" which has some patterns on it. It looks like you can do this 100 times each. 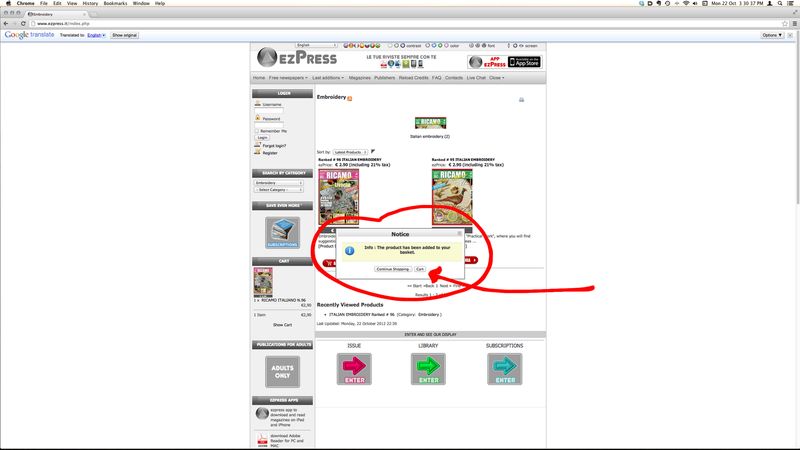 What they don't tell you is that the magazine file is 74.1MB so that takes a few minutes to load. 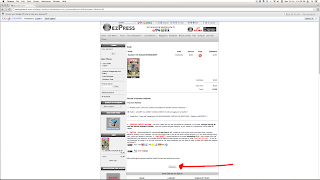 The 'foglione' is only 135 KB (for issue 96). The magazine is 86 pages. If you choose the subscription, you get the same price that Italians get for a printed subscription and you'll get "12 months". Just a word to the wise, this magazine does not always print issues in consecutive months so "12 months" usually takes you into the following year. 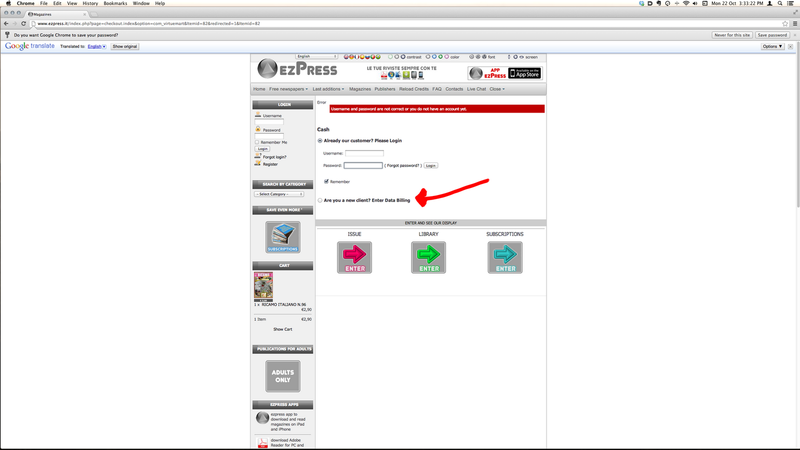 This can be confusing but at least this way, you'll know it didn't get lost in the mail! Photo copyright Associazione Punto Maglie. The town of Maglie is located in the Apulia region of south-east Italy. The heel of the boot if your Italian geography is a little vague. 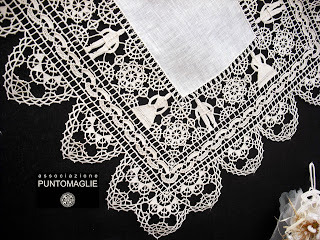 Punto Maglie or Maglie Embroidery is a type of needle lace which takes its origins from Burano, the famous lace-making island in the Venetian Lagoon. 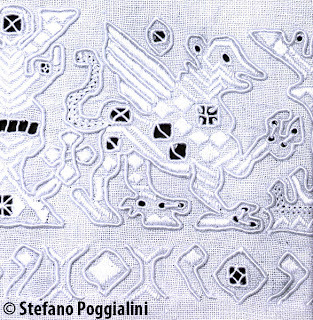 Characteristics particular to Punto Maglie are the human figures (pupo or pupa, masculine or feminine) often found among the geometric motifs, the most important of which are the star motifs. 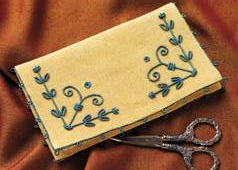 Inserts are built upon a support of fabric with the pattern attached on top and are then cut away from the support and inserted into fabrics. 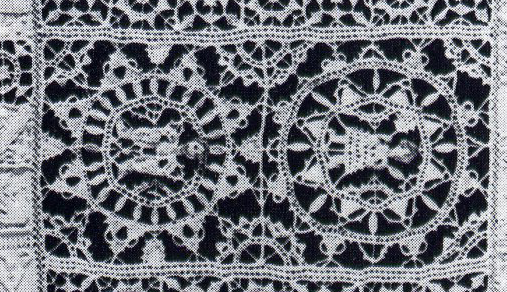 Whole pieces can be constructed in this manner or by withdrawing some threads of the ground fabric and building on top of it in a similar method to traditional Reticello. 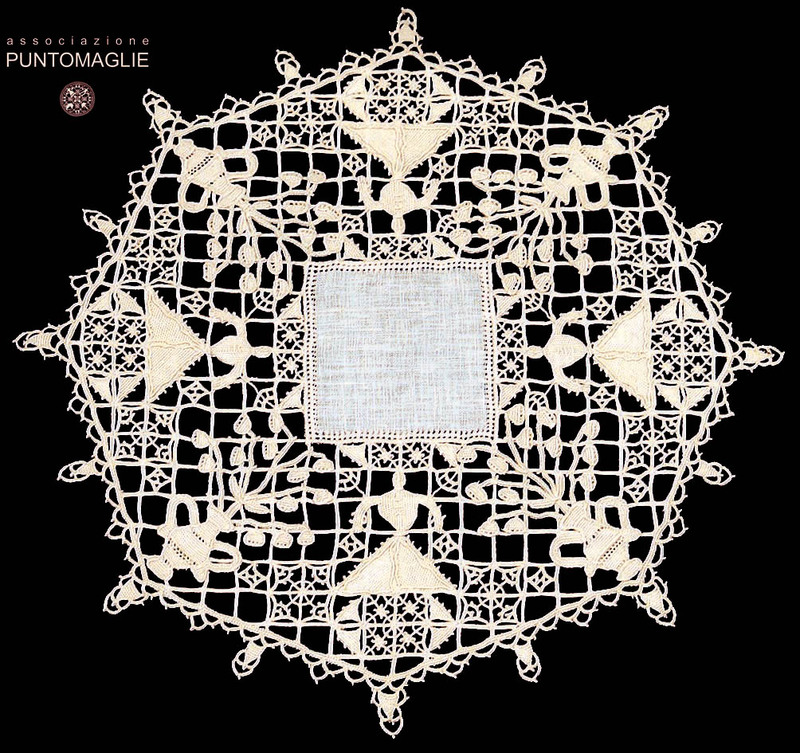 In 1905, as an experiment, evening embroidery and lace classes were added to the curriculum of an Applied Arts school instigated by Egidio Lanoce, advocate and pioneer of technical schools for the working classes. It was here that Punto Maglie was born. 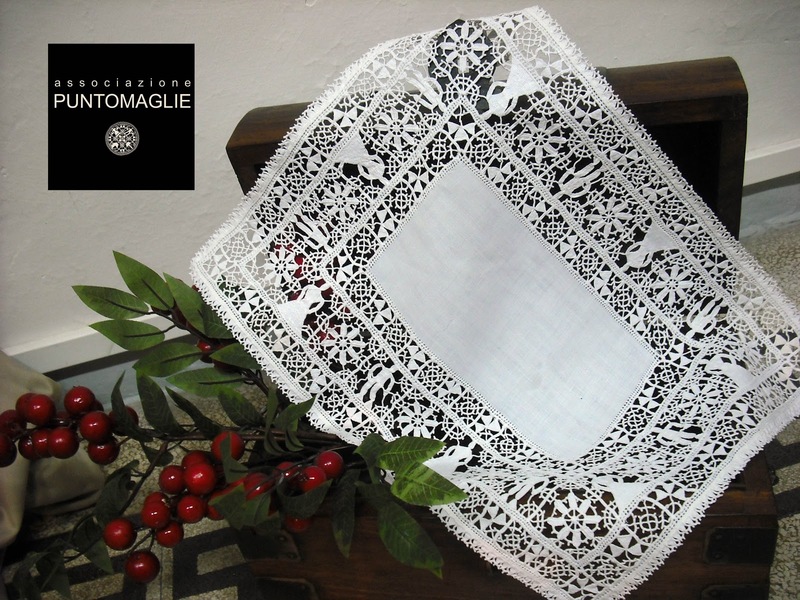 Around the same time a local noblewoman, Lady Carolina De Viti De Marco in Starace started a group of embroiderers, some who had trained at the Applied Arts school, to produce embroidered items to sell in order to supplement their household incomes. Lady Carolina and her descendants would go on to become very important to the textile arts of the area, but let's leave that for another post. Embroideries and laces from Maglie were exported to America and other European countries and participated and were recognized in the various International Fairs of the period. Magie enjoyed much success with these endeavours until the years of the First World War. 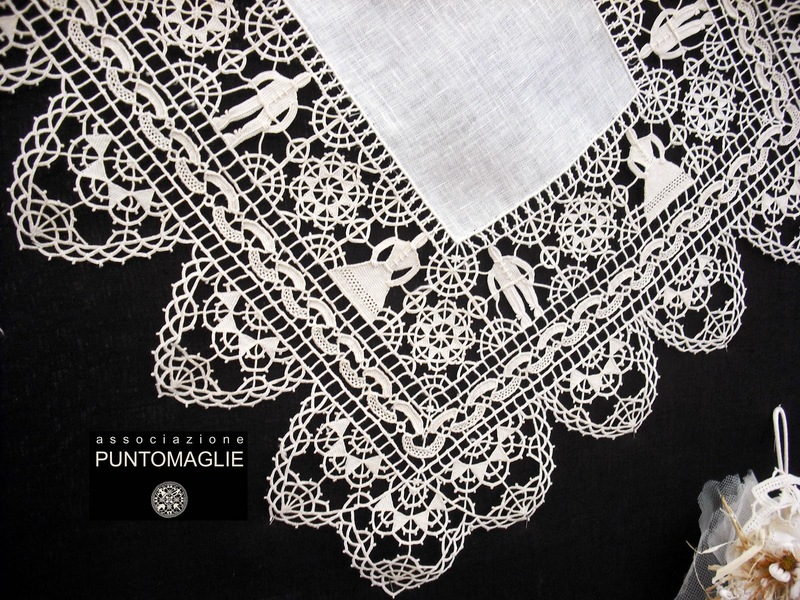 Today the tradition of Punto Maglie is continued by the embroidery school Associazione Punto Maglie located at no. 60 via Luigi Puzzovio in Maglie. You can contact them by email at: punto maglie @ virgilio . it (remove all the spaces between the characters). Many thanks to Liliana for the photos! 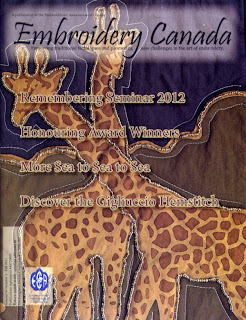 A note to let Canadian readers know that in the fall 2012 issue of the Embroiderer's Association of Canada (EAC)'s magazine Embroidery Canada, the last photo of my article on the Gigliuccio Hemstitch is missing.